Harvard is set to play in the WNIT for the fourth consecutive year, tipping off against Drexel at 7:00 on Friday. Unlike in previous years, though, the Crimson will be playing in the friendly confines of Lavietes Pavilion as it seeks to prolong its season. Harvard (16-12, 9-5 Ivy) comes into the game eager to wash away the bitter taste from its disappointing end to the league season. After leading the conference in point differential in the regular season and playing two overtime games against Penn, the Crimson was stunned by the Quakers in the Ivy League tournament in New Haven, falling 91-62. It was Harvard’s worst loss in league play and worst overall since it lost to then-No. 1 Notre Dame by 45 in its season opener. Penn’s size and skill proved to be too much for the Crimson the third time around, as the Quakers — ranked eighth in the nation in scoring defense — dominated every facet of the game and put it away early. After No. 9 seeded Hofstra upset top-seeded James Madison in the first round of the CAA tournament, No. 2 Drexel would have felt great about their chances to win the conference and secure an automatic bid to the NCAA tournament. But while they did reach the finals, the favored Dragons fell 53-49 to No. 4 Towson in the championship game, sending them to the WNIT. Every possession will count for the Crimson against a tough Drexel team that generally plays mistake-free basketball. The Dragons rank 13th in the country in fewest turnovers and 22nd in turnover margin, making it imperative for Harvard to hold onto the ball and at least get a shot on each possession, something it has sometimes struggled to do against tough opposition. The Crimson will also seek to clamp down on junior forward Bailey Greenberg, who not only leads Drexel in scoring at 17.5 points per game but also is the team’s leading rebounder and is the only Dragon averaging double figures in points. Harvard features a much more balanced group of scorers. Junior guard Katie Benzan leads the team with 14.2 points per game, and she’s joined in double figures by sophomore forward Jadyn Bush and co-captain guards Madeline Raster and Sydney Skinner. 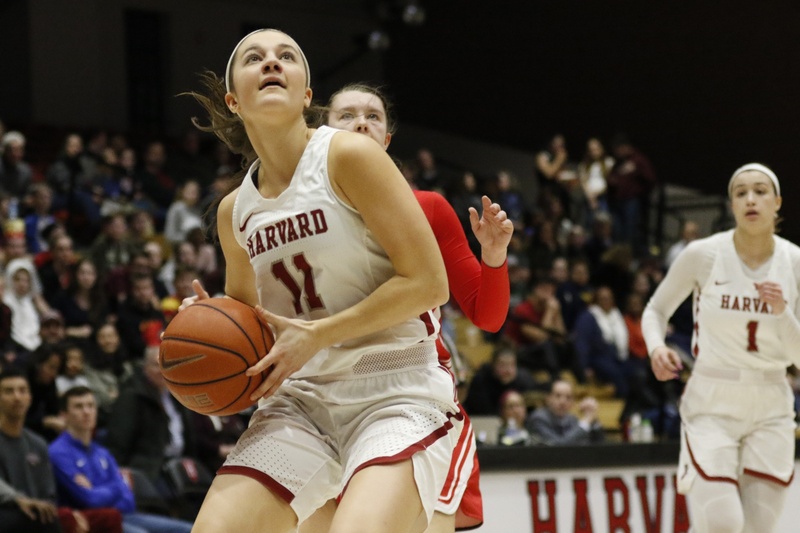 While Benzan led the Crimson with 12 points against Penn, Harvard’s leading scorer sometimes struggled with her shot, shooting 4-of-14 from the floor and 4-of-13 from three point range. Seniors Raster, Skinner, and Nani Redford, who are playing in their fourth straight WNIT, will try to ensure that this is not their final game in a Crimson uniform. They will be relied upon as usual to provide a threat from beyond the arc and to lock down on defense. While the guards were very much the focal point against a big Penn team, Harvard may have the chance to get its forwards more involved against Drexel. Bush and junior forward Jeannie Boehm, who helped key dominant team rebounding performances for so much of the regular season, should have the advantage down low against an average rebounding and poor shot blocking team. The Drexel game should be a refreshing change for Bush and Boehm after they struggled to deal with Ivy League Defensive Player of the Year Eleah Parker last Saturday. The Crimson will seek to move onto the second round of the WNIT for the second time in three years while also trying to avenge a double-digit loss to Drexel in the 2013 WNIT. The winner of Friday’s game will face the winner of Georgetown and Sacred Heart early next week.